Last weekend I finally got around to doing something that I've been meaning to do for quite a while, and that is to create my own signature burger. Of course a signature burger requires a catchy name. It's pretty obvious by the name of mine that I'm lacking in the catchy name department of late. The first order of business when developing a signature burger is to come up with a great custom burger blend. Standard grocery store ground beef just doesn't cut it. Oh, and those pre-packaged chubs... Three words: nasty mystery meat. I did some research on various blends and landed on a mixture of 50% grass-fed chuck, 30% grain-finished tri-tip, and 20% grass-fed shoulder. I simply had the butcher at the local Whole Foods grind it for me. They were very friendly and happy to help. You might be wondering what all of this fancy schmancy meat cost me. Well, it was admittedly a little pricey at $9.40 per pound, but not crazy expensive. A little quick math puts it at $4.70 per 8-ounce burger, which is pretty reasonable given the results. If you don't want to deal with custom blend, or you don't have access to great beef, just use a good quality 80/20 ground beef. As for cooking, this may sound like blasphemy for a "barbecue guy", but I found that standard grilling simply didn't provide that beautiful brown crust that a blue ribbon burger deserves. Grill marks are great, but I want the entire surface to be one huge grill mark. Using a cast iron griddle on my grill provided the crust that I was after. Just make sure that you preheat to as hot as you can get it. Finally, a signature burger calls for signature accessorizing. I nestled the burger in a jalapeno-cheese roll smeared with a good dose of spicy ketchup, and topped it with a slice of medium cheddar cheese, chopped bacon, a slice of grilled onion, ripe tomato, and crisp lettuce. 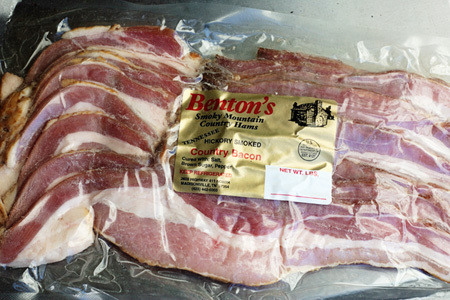 Quick aside: When I say that Benton's bacon is the best on the planet, that is no joke. They make seriously old-school bacon and hams in the hills of Tennessee. The stuff is so popular that there's a three-plus week wait just to get some shipped to you. Yes, it's worth the wait. Start your grill and prepare for direct cooking at high heat (450-500º). Put a cast iron griddle on the grates to preheat. Divide the beef into four evenly sized balls (8 ounces each) and gently form them into 4-inch patties of even thickness. Use your index finger to put an indentation in the center of each patty. This helps them stay flat while cooking. Season each side of each burger with 1/4 teaspoon of the steak seasoning, set aside. When the grill and griddle are preheated, cook the burgers on the griddle for four minutes. While the burgers are cooking, spray both sides of each onion slice with cooking spray and grill them on a vacant spot on the grill. Remove the onion slices to a plate once they've softened a little and have some grill marks. Mix the ketchup and gochujang sauce well in a small bowl and set aside. Flip the burgers and cook them another four minutes, or until they reach an internal temperature of 145º. 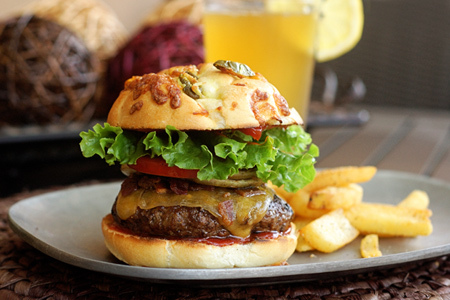 Add a slice of cheese to each burger during the last minute of cooking. Remove to a platter and set aside. 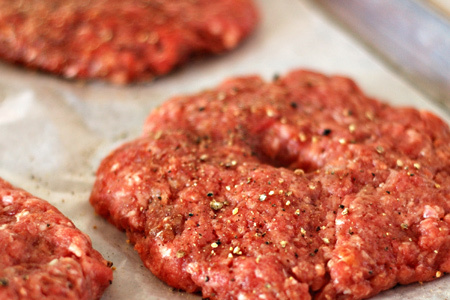 Caution: If you're using standard pre-packaged ground beef, you must cook it to an internal temperature of 165º. Toast the buns over direct heat. Smear half a tablespoon of the ketchup mixture on each bun half, add a burger to each bun and top each with a quarter of the chopped bacon, a slice of onion, two slices of tomato, and a leaf of lettuce. Hey John- Probably a stupid question... but when you say that a portion of the patty is "shoulder"... is it safe to assume that you are referring to beef and not pork? Anonymous - Yup, it's all beef. trying not to show my beef ignorance, what cut is beef shoulder, is it a roast cut? Steve - The shoulder is simply a shoulder roast, sometimes called a "shoulder pot roast", or "English roast".